Junior closer Will Kobos takes over the mound in the Colonials second game of the day to knock VCU from the tournament Wednesday night. Baseball extended its postseason run one more day after battling elimination Wednesday night in the first round of the Atlantic 10 Championship hosted by GW at Tucker Field. The Colonials (30-25) opened with an 11–3 loss to No. 2 seed George Mason (27-25) Wednesday afternoon after securing the seventh and final seed in the tournament last week. With their season on the line, the Colonials were led by sophomore pitcher Jaret Edwards in their second game against No. 6 VCU (34-23) Wednesday, capturing a 4–1 victory and advancing GW to the second round of play in the consolation bracket. The Colonials will face the loser of the George Mason-Fordham game Thursday at 5 p.m. The Patriots dominated the game on both sides of the ball Wednesday afternoon, blowing out the No. 7 Colonials 11–3. George Mason plated 16 hits, including six for extra bases, to back a stellar performance by junior right hander Zach Mort. Mort threw seven innings of three-run ball and limited the conference’s top offense to six hits. On the mound, the Colonials turned to senior third baseman and A-10 Player of the Year Isaiah Pasteur, who entered the game with a 0.75 earned-run average over 24.1 innings of work in conference play. Pasteur struggled to get outs and saw his pitch count rise quickly in the early frames. He exited the game after allowing eight hits, seven earned runs and five walks in 4.1 innings. GW got on the board early, manufacturing the game’s first run with a small-ball approach in the first inning. Mort issued a leadoff walk to Pasteur and after a groundout and a steal, senior shortstop Robbie Metz drove his 40th run of the year to send Pasteur home to put the Colonials ahead 1–0. Pasteur needed 36 pitches to get through the bottom of the first inning, issuing two walks and allowing three base hits, while the defense committed two errors. GW trailed 3–1 heading into the second inning. Pasteur ran into trouble again on the mound in the third, when George Mason junior third baseman Greg Popatak deposited a first pitch fastball over the center field wall for his fifth long ball of the year to push the Patriots’ lead 4–1. The game got away from the Colonials after a four-run showing in the fifth inning by the Patriots. Back-to-back base hits by Popatak and senior infielder Michael Smith – who were on base a combined eight times – followed by a walk set up a bases-loaded situation with just one out. Redshirt senior center fielder Frank Sturek delivered a one-out double down the left field line to score two runs for George Mason. A two-run RBI single by redshirt junior outfielder Brady Acker pushed the Patriots’ lead 8–1. 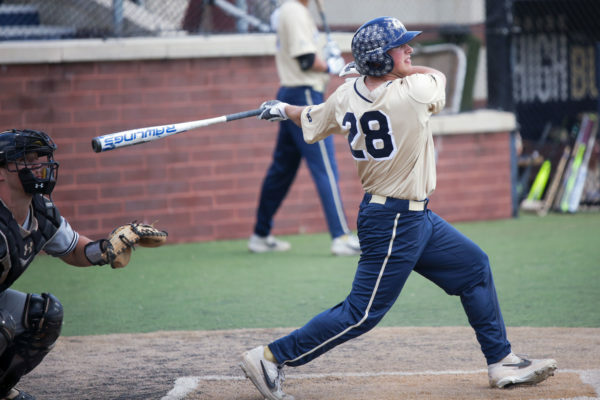 GW’s final two runs of the game came in the seventh inning courtesy of bench contributors freshman infielder Trevor Kuncl and redshirt junior first baseman Sam Martin. With the loss, the Colonials faced elimination in the nightcap against VCU, who took 2-of-3 in a series at Tucker Field less than two weeks ago. Edwards tossed a 131-pitch masterpiece Wednesday night, falling just two outs short of a complete game against VCU. Edwards’ performance was the highlight in a 4–1 GW victory that saved the Colonials’ season and knocked out the No. 6 seed VCU Rams from competition. The Rams started with junior pitcher Sean Thompson on the mound, who entered with a 3.02 ERA and an 8–1 record on the season. Thompson struggled to find the zone in the first inning, issuing two walks and hitting senior center fielder Mark Osis to load the bases. A base hit by junior designated hitter Dominic D’Alessandro gave the Colonials an early 2–0 advantage. VCU’s first and only run came in the bottom of the third inning when sophomore third baseman Paul Witt knocked a single into left field with runners on first and second to cut GW’s lead to 2–1. The Rams had another good look at the lead when sophomore right fielder Brett Willett doubled to center field, putting the go-ahead run on base for sophomore catcher Josh Simon with two outs. Edwards froze Simon on a third strike to escape the fourth inning. The usually-stoic sophomore was animated walking off the mound, pumping his fists in the air and bursting with confidence. GW took a patient approach against Thompson at the plate. By fouling off balls to extend at-bats, the Colonials chased Thompson from the game after 5.2 innings, driving up his pitch count to 115. The Colonials added to their one-run lead in the top of the ninth when Metz knocked a base hit through the middle, scoring senior catcher Brandon Chapman and advancing Pasteur to third. A wild pitch allowed Pasteur to score from third base, beating the tag-out at home and pushing the Colonials’ lead 4–1. 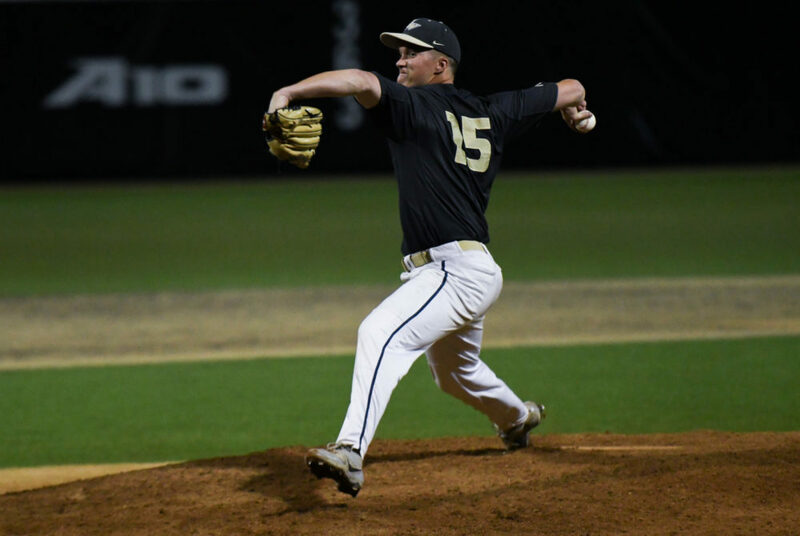 With two men on base and one out in the bottom of the ninth, junior closer Will Kobos needed just seven pitches to eliminate the Rams from the tournament.